NOTE: FILING THIS APPLICATION DOES NOT ENTITLE A VESSEL TO DOCUMENTATION OR TO ANY CHANGES SOUGHT ON A CERTIFICATE OF DOCUMENTATION. OFFICIAL NUMBERS DESIGNATED ON THE BASIS OF THIS APPLICATION ARE NOT TRANSFERABLE. ONLY A CURRENT CERTIFICATE OF DOCUMENTATION IS VALID FOR VESSEL OPERATION. Insert name by which you wish the vessel to be known. If applying to change the vessel's name, insert the old vessel name in parenthesis. Only standard Alpha and Numeric Characters in the vessel name will appear on the Certificate of Documentation. Click icon for attachment if application covers multiple vessels. Insert the Official Number (O/N) awarded by the Coast Guard for all but Initial Issue cases. Insert Hull Identification Number (HIN) as assigned in accordance with 33 CFR 81. Insert International Maritime Organization Number (IMO), if any. Insert name of place and state exactly as it is or will be marked on the vessel. The hailing port must be a place in the United States. Commonly used abbreviations such as ‘NY, NY’ are acceptable. Name, e-mail address, and telephone number of the owner to whom the Coast Guard should send correspondence and their Social Security Number (SSN) or Tax Identification Number (TIN). Only an owner or part owner can be the managing owner. For vessels owned by a corporation, the corporation is the managing owner. For a trust arrangement, the trustee is the managing owner. For a Partnership or a LLC, the name of the Partnership or the LLC should be shown. IS THIS NUMBER YOUR SOCIAL SECURITY NUMBER OR YOUR TAX ID NUMBER? Enter the mailing address. If physical (street) address differs from mailing address, enter BOTH. H. Are There Other Persons / Entities That Own an Interest in the Vessel? If no, leave as is, otherwise select yes. Include all persons/entities (other than managing owner) who own an interest in the vessel below. If using Social Security Number leave Tax ID Number empty. If using Tax ID Number leave Social Security Number empty. Check applicable blocks to show purpose of application. If vessel has never been documented, check Block #5 and provide ALL requested information known about the vessel's place and year of build, hull material, approximate length, and previous names and numbers. If this information is unknown, please indicate. 4. RETURN TO DOCUMENTATION FOLLOWING DELETION. 5. APPLICATION FOR OFFICIAL NUMBER AND FIRST CERTIFICATE OF DOCUMENTATION. Check the appropriate block(s) to indicate all endorsement(s) sought on this application. Vessel must be owned by a U.S. citizen eligible for the endorsement(s) sought. Select the section that describes the type of entity that owns the vessel. Citizenship for all owners must be provided. INDIVIDUAL: Includes native born and naturalized U.S. citizens. GOVERNMENT ENTITY: Includes Federal, State, Territory, Possession or Subdivision. CORPORATION: Complete all items that apply. LIMITED LIABILITY COMPANY (LLC): Complete Equity Section and choose type. For member managed LLC, a list of members is required. Click icon for attachment if application covers multiple members. PARTNERSHIP: Complete Equity Section and choose type. A list of all general partners is required. Click icon for attachment if application covers multiple general partners. CORPORATIONS QUALIFIED UNDER 46 CFR 68.01 OR OWNED BY A NOT-FOR-PROFIT OIL RECOVERY COOPERATIVE: Attach a copy of the Certificate of Compliance or Letter of Qualification issued by the Director, NVDC. JOINT VENTURE/ASSOCIATION: A list of all joint venturers/members is required. The percentage held by each need not be shown. Click icon for attachment if application covers multiple joint venturers/members. TRUST ARRANGEMENT: All trustees must be U.S. citizens. If applicable, each beneficiary with an enforceable interest must be a citizen. A list of all trustees (except managing owner) and beneficiaries with an enforceable interest is required. Click icon for attachment if application covers multiple trustees/beneficiaries with an enforceable interest. CORPORATION (SEE SECTION M, ITEM 4 WHEN APPLYING FOR A FISHERY OR COASTWISE ENDORSEMENT). I (WE) CERTIFY THAT THE CORPORATE STRUCTURE HAS NOT CHANGED SINCE ISSUANCE OF THE CERTIFICATE OF COMPLIANCE. I (WE) CERTIFY THAT THE INFORMATION ON FILE WITH REGARD TO COOPERATIVE AND ISSUANCE OF THE LETTER OF QUALIFICATION REMAINS UNCHANGED. I (WE) CERTIFY THAT ALL MEMBERS OF THIS (JOINT VENTURE) (ASSOCIATION) ARE CITIZENS OF THE UNITED STATES, ELIGIBLE TO DOCUMENT VESSELS IN THEIR OWN RIGHT WITH THE ENDORSEMENT(S) SOUGHT. LIMITED LIABILITY COMPANY (LLC): (COMPLETE EQUITY SECTION AND CHOOSE TYPE) (SEE SECTION M, ITEM 5 WHEN APPLYING FOR A FISHERY OR COASTWISE ENDORSEMENT). EQUITY INTEREST OWNED BY PERSONS ELIGIBLE TO DOCUMENT VESSELS IN THEIR OWN RIGHT WITH THE ENDORSEMENT SOUGHT IN ACCORDANCE WITH 46 CFR PART 67 (SUBPART C). 1. MEMBER MANAGED LIMITED LIABILITY COMPANY I (WE) CERTIFY THAT ALL MEMBERS OF THIS LLC ARE CITIZENS OF THE UNITED STATES ELIGIBLE TO DOCUMENT VESSELS WITH THE ENDORSEMENT(S) SOUGHT IN THEIR OWN RIGHT. 2. LIMITED LIABILITY COMPANY NOT MANAGED BY MEMBERS AND NOT SIMILAR TO GENERAL PARTNERSHIP: PLEASE NOTE (A) & (B) MUST BE CHECKED FOR FISHERY AND COASTWISE ENDORSEMENTS; NOT REQUIRED FOR COASTWISE OIL SPILL OR COASTWISE UNDER CHARTER ENDORSEMENTS. I (WE) CERTIFY THAT ALL PARTNERS IN THIS PARTNERSHIP ARE CITIZENS OF THE UNITED STATES ELIGIBLE TO DOCUMENT VESSELS WITH THE ENDORSEMENT(S) SOUGHT IN THEIR OWN RIGHT. I (WE) CERTIFY THAT ALL GENERAL PARTNERS IN THIS PARTNERSHIP ARE CITIZENS OF THE UNITED STATES, ELIGIBLE TO DOCUMENT VESSELS WITH THE ENDORSEMENT(S) SOUGHT IN THEIR OWN RIGHT. I (WE) CERTIFY THAT ALL TRUSTEES AND ALL BENEFICIARIES WITH AN ENFORCEABLE INTEREST IN THIS TRUST ARRANGEMENT ARE CITIZENS OF THE UNITED STATES, ELIGIBLE TO DOCUMENT VESSELS WITH THE ENDORSEMENT(S) SOUGHT IN THEIR OWN RIGHT. Complete as appropriate. The law provides severe penalties for false statements against both the person (including agents) making the statement and against the vessel for which it is made. (b) WILL AT ALL TIMES REMAIN UNDER THE COMMAND OF A U.S. CITIZEN, UNLESS DOCUMENTED SOLELY WITH A RECREATIONAL ENDORSEMENT; WILL NOT BE OPERATED IN A TRADE NOT AUTHORIZED BY THE ENDORSEMENT(S) ON THE CERTIFICATE(S) OF DOCUMENTATION. THE NAME(S) OF THE VESSEL(S) WILL NOT BE CHANGED WITHOUT APPROVAL FROM THE NATIONAL VESSEL DOCUMENTATION CENTER; AND I (WE) WILL PROMPTLY NOTIFY THE NATIONAL VESSEL DOCUMENTATION CENTER UPON A CHANGE IN ANY OF THE INFORMATION OR REPRESENTATIONS IN THIS APPLICATION. THE FOLLOWING ITEM (5.) IS REQUIRED FOR COASTWISE AND/OR FISHERY ENDORSEMENTS; HOWEVER, IT IS NOT REQUIRED FOR COASTWISE BOWATER ONLY, OIL SPILL, OR UNDER CHARTER ENDORSEMENTS. 5. U.S. CONTROL CERTIFICATION: THERE IS NO CONTRACT OR UNDERSTANDING THAT PROVIDES MORE THAN 25% OF THE VOTING POWER IN THE PARTNERSHIP, LIMITED LIABILITY COMPANY, CORPORATION, OR OTHER OWNING ENTITY EITHER DIRECTLY OR INDIRECTLY ON BEHALF OF ANY PERSON NOT A CITIZEN OF THE UNITED STATES. BY NO MEANS WHATSOEVER IS CONTROL IN EXCESS OF 25% CONFERRED UPON OR PERMITTED TO BE EXERCISED BY A PERSON WHO IS NOT A CITIZEN OF THE UNITED STATES. APPLICATION FEES ARE NOT REFUNDABLE (46 CFR 67.500 (e)). PRIVACY ACT STATEMENT IN ACCORDANCE WITH 5 U.S.C. 553a, THE FOLLOWING INFORMATION IS PROVIDED TO YOU WHEN SUPPLYING PERSONAL INFORMATION TO THE U.S. COAST GUARD. 1. AUTHORITY. SOLICITATION OF THIS INFORMATION IS AUTHORIZED BY 46 U.S.C., CHAPTERS 121 AND 125; 46 U.S.C. APP. 802 AND 883. 2. THE PRINCIPAL PURPOSES FOR WHICH THIS INFORMATION IS TO BE USED ARE: (1) TO DETERMINE CITIZENSHIP OF THE OWNER OF THE VESSEL FOR WHICH APPLICATION FOR DOCUMENTATION IS MADE; AND (2) TO DETERMINE ELIGIBILITY OF THE VESSEL TO BE DOCUMENTED WITH THE TRADE ENDORSEMENT SOUGHT. 3. THE ROUTINE USES WHICH MAY BE MADE OF THIS INFORMATION INCLUDE RELEASE TO LAW ENFORCEMENT OFFICIALS, TO THE GENERAL PUBLIC UNDER FREEDOM OF INFORMATION ACT, AND TO PUBLISH INFORMATION ABOUT U.S. DOCUMENTED VESSELS. 4. DISCLOSURE OF THE INFORMATION REQUESTED ON THIS FORM IS VOLUNTARY, HOWEVER, FAILURE TO PROVIDE THE INFORMATION REQUESTED WILL RESULT IN DENIAL OF THE APPLICATION FOR DOCUMENTATION, WHICH MAY PREVENT THE OWNER FROM OPERATING THE VESSEL(S) IN A SPECIFIED TRADE. I (we) understand that making a false statement when applying for vessel documentation may subject the vessel to seizure by and forfeiture to the United States Government (46 USC §12151, formerly 46 USC §12122). GRANTOR. FOR PURPOSES OF THIS FORM, GRANTORS INCLUDE MORTGAGORS, ASSIGNORS, PERSONS ASSUMING MORTGAGES, PERSONS GRANTING SUBORDINATION OF MORTGAGES. LIST ALL GRANTORS AND ADDRESSES. GRANTEE. FOR PURPOSES OF THIS FORM, GRANTEES INCLUDE MORTGAGEES, ASSIGNEES, PERSON FROM WHOM MORTGAGES ARE ASSUMED, AND PERSON TO WHOM SUBORDINATION OF MORTGAGES ARE GRANTED. LIST ALL GRANTEES AND ADDRESSES. IF THE FOLLOWING INFORMATION IS UNKNOWN YOU MUST ORDER AN ABSTRACT OF TITLE UNDER ADDITIONAL SERVICES TOWARDS THE TOP OF THE PAGE. Eliminate the possibility of late fees and reinstatement fees by paying your yearly renewal documentation in advance. 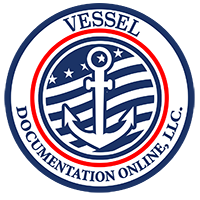 Your certificate of documentation will be automatically renewed each year, per the number of years selected, by Vessel Documentation Online LLC. NOTE: The NVDC only issues their vessel renewals for a period/duration of one year each. Your yearly certificate will be valid for one year only. You will receive one (1) Year long certificate each year, depending on how many additional years you have ordered. For each individual year of renewal a new renewal will be AUTOMATICALLY forwarded to your designated address at time of renewal(s). This may require that the vessel owner update their current address to facilitate the renewal process.